With all we're hearing about the benefits of drinking tea, more and more people are putting down that coffee mug and opting for a brisk cup of tea. Jokari's Healthy Steps Total Tea Infuser is the adept way to brew a cup of tea using either loose leaves or bagged tea. The cleverly designed spoon hopper allows you to measure, swirl and steep your esteemed tea neatly and without messy tea leaves in your cup. And, the handy built-in plunger is great for pressing teas to release more flavor. If you're feeling creative, why not add a little cinnamon stick, orange peel, fresh mint or cardamom to the Total Tea Infuser along with the tea of your choice? Jokari's Healthy Steps Total Tea Infuser measures 1.6 x 1 x 7.5 inches overall - the excellent size to carry along wherever your tea adventures may take you! For over 40 years, Jokari has held a special place in its heart for gadgets; today, they specialize in providing affordable solutions to common problems faced by consumers. From unique kitchen gadgets and household storage and organization solutions to their Healthy Steps kitchen tools designed to help with portion control and healthy eating, Jokari is committed to creating useful and often crazy looking "thingamajigs" that are fun, colorful and easy to use. 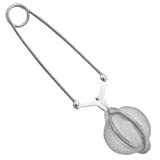 Stainless Steel Mesh Tea Spoon Strainer 1.75 "
Quality design makes this stainless steel tea spoon a culinary must-have! Simple to use, the hinged design enables easy insertion or removal of leaves. For cleanup, rinse with soap and water or toss in the dishwasher. Built to last. 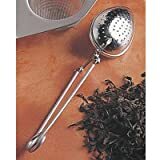 Lund's Stainless steel tea diffusers provide a sturdy home for your loose teas and herbs. Open the spoon lid and put the tea in it before your drinking. The tail of the spoon could also be a hanger hooking on the edge of the cup. Creative and useful design helps you enjoy your tea drink. 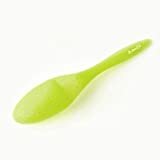 Open the spoon lid and put the tea in it before your drinking.The tail of the spoon could also be a hanger hooking on the edge of the cup.Creative and useful design helps you enjoy your tea drink. 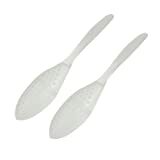 Tea Spoon Material : Silicone Dimension: 1" L x 1 2/5" W x 5 4/5" H For loose or bagged tea Easy to use and clean. 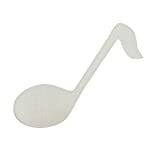 Designed in perforated music note shape, this teaspoon will be great for you to make tea at home or at office. 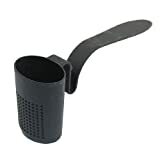 Tea spoon strainer is not harmful and lightweight, holes design stainer. 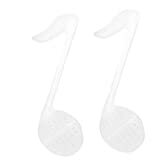 Plastic tadpole shape design. Can be cleaning, reusable.